It's mind boggling to see all the creativity, ingenuity and pure madness that's gone into explaining away observations and experiments that disprove old "laws" and theories. Oh, Mercury does not move as it should according to Copernicus and an experiment (Michelson-Morley) shows that the Earth is in fact not hurtling around the Sun at 100,000 kph. Bring out Einstein and proclaim that light bends even time itself (but only when it's self aware imaginary photons figures out they are in vacuum). Oh, binary stars do not move as Newton and Einstein predicts. Assume the smaller star has ridiculously high mass. Sigh. I guess our next generation of thinkers has their work set out - Tear down about 100 years of BS and start from there. The Tychos model and the Stellar Metamorphosis theory are the first new ideas in astronomy that actually make sense. If the Moon is a dead star/planet, then it's an object the size of Africa with a mass about the same as Earth. Well then it makes sense that it seems to have such influence over the other celestial bodies (as Simon shows in his book). And the fact that the Moon from its distance can significantly reduce gravity (tides) (gravity being diamagnetic or something else) here on Earth is also testimony to that. Well, and my point is I don't think the Moon necessarily needs greater mass to have a "massive" effect if you get my drift. What we consider to be "mass" may be nothing more than the effect of a greater attraction or magnetic pit itself causing so-called "weight" rather than saying "more molecules" equals "more gravity". I don't think it's so simplistic. At least, not in that Newton-assumed connection. I think this is a fair line of questioning now considering we are seeing much more "massive" objects orbiting smaller ones and so on. Just as a large metal ball can have a tiny electric charge and a BB can be super-magnetized, I think this is more along the lines of what we may have to consider. Size matters, certainly, but the size of something invisible or pseudo-visible may be more critical than mere physical presence or something better than "atomic mass" theory. Good point, and Earth has a large nickel and iron core and that may be what's left of the old planet/star Moon and therefore it's highly magnetic. aa5 » June 5th, 2016, 12:26 pm wrote: On the other hand, if it is a pure pulling force, then why would the moon not be pulled towards the earth. The moon appears to be synched up with the earth, like caught in a magnetic orbit. Hello all, this is my first post following the handskake introduction. I'd like to add these video clips to this thread to demonstate a form of magnetic equilibrium between two or more obviously magnetized objects. I'm sure you'll find it as mesmerising as I do and hopefully the visuals will enable opening other doorways within minds. Should we think that these magnetic toys have a connection to planetary physics? Last edited by Mansur on Sun Sep 30, 2018 1:58 pm, edited 1 time in total. Mansur wrote: Should we think that these magnetic toys have a connection to planetary physics? Most certainly and beyond reasonable doubt - as far as I can see. We live in a magnetic universe. It is quite extraordinary that our world's best scientists have failed to reach such an obvious conclusion. What remains to be explained is : WHAT is magnetism - and HOW are those attractive/repulsive forces generated? (The blue dot in the middle is Earth - which revolves at snail pace [about 1mph] around its clockwise orbit once every 25344 solar years). Mansur » September 30th, 2018, 6:31 am wrote: Should we think that these magnetic toys have a connection to planetary physics? Mansur, a Ferrocell is an invention that allows us to see in virtual 3D, the magnetic field lines of magnetism. A humbling glimpse through the eye of God if you will. Allow me to let the image bespeak a thousand years generations and words, yet to answer you specifically, the Universe of all matter is the orchestra, but Magnetism is the Conductor. I probably wouldn’t characterize magnetism as “the Conductor,” but I can’t help but view it as perhaps the invisible orchestra created and directed by the Conductor. But that is an issue outside the scope of this forum, and one I will not even attempt to tackle here. That said, I found that short video to be fascinating, especially in relation to how it matches the TYCHOS. Amazing really. It reminds me of a Latin phrase from law school: res ipsa loquitur, translated in English as “the thing speaks for itself.” It’s a “doctrine” that, when properly recognized, extends well beyond the legal field of torts. I’ve always marveled at the order of the universe, and how it can be viewed in the broadest ranges imaginable, from the cosmos down to the intricate and symmetrical beauty of a sunflower. This is wonderful. Finally someone that (seemingly) understands the Tychos model's underlying physical principles ! Not that I ever went there - as I wrote my Tychos book. All I did was geometry / versus empirical astronomical observations. a clockwise /counterclockwise relationship between our planet - and all our surrounding moons & planetary bodies - Sun included). Now, Ken Wheeler's brilliant brain doesn't seem to connect his findings to the very solar system that we live in. But I'm sure he will, in due time. I truly think that we are at the gates of a new, "explosive" (yet hopefully peaceful) scientific revolution - and am naturally quite happy to have contributed to it. I'm thrilled to read the seemingly word as that is where I am in this point in time, standing on the edge of that ferrocell ring and peering in trying to comprehend it all. I would know a fair bit more if not for Ken Wheeler aka Theoria Apophasis making me want to drill out my own eardrum's for relief. Yes, he does have a brilliant mind but his teaching skills leave me wanting. I'm glad you could bare it lol. Last edited by Arcuveil on Mon Oct 01, 2018 7:31 am, edited 1 time in total. Mansur » September 30th, 2018, 8:01 pm wrote: I still can not see what these magnetic-optic toys have to do with planetary physics. If magnets that we can play with on Earth resemble our planetary system, it is quite likely that the same behaves just as magnets behave on Earth. The only existing planetary system that resembles the magnetic behavior (as verifiable on Earth) happens to be the TYCHOS. 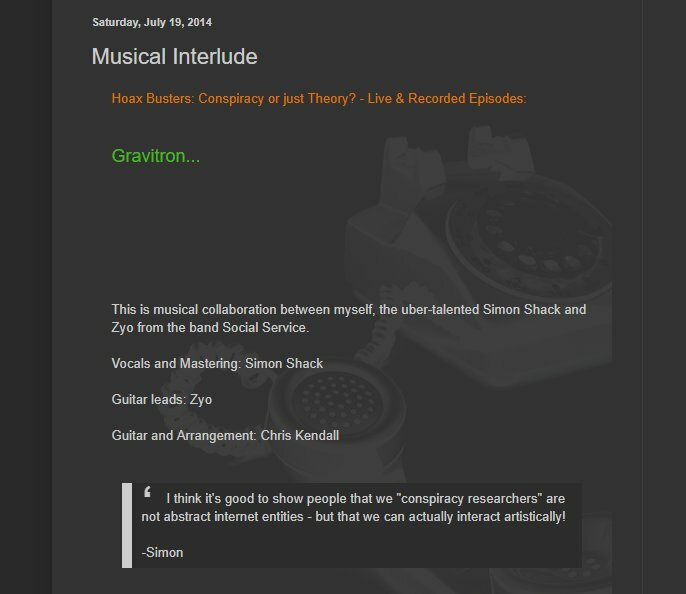 So I'm posting here on this gravity thread a tune called "Gravitron" - which goes back a few years (2014) as I was communicating with Chris Kendall (of http://hoaxbusterscall.blogspot.com/2014/07/). At the time, Chris told me he was also a hobbyist musician - like myself - and he sent me a link to some of his instrumental tracks. One of them ("Gravitron") struck me as particularly cool, so I asked Chris if he would let me put some vocals on it. He said "sure!" - so I downloaded his "hard rock" Gravitron track. It was quite a different kind of music than what I'm used to sing on - and I scratched my head for a while as to what sort of vocals I could come up with. My band's lead guitarist (Fabio, a.k.a. "Zyo") came around one day and put a solo guitar line on the track - and it all somehow came together... Chris then posted it on his blog - but for some reason the link to the mp3 audio file is now broken. Hope you'll enjoy this "joint venture" of a tune! Pump up the volume to high heaven! Absolutely brilliant (and scorchingly funny) episode of Ken Wheeler's MAGNETISM LECTURE series. A must watch (I mean, "must listen"). Ken's hilarious deconstruction of mainstream science / physics (and the clownish "priests" behind the cult) is a joy to listen to.